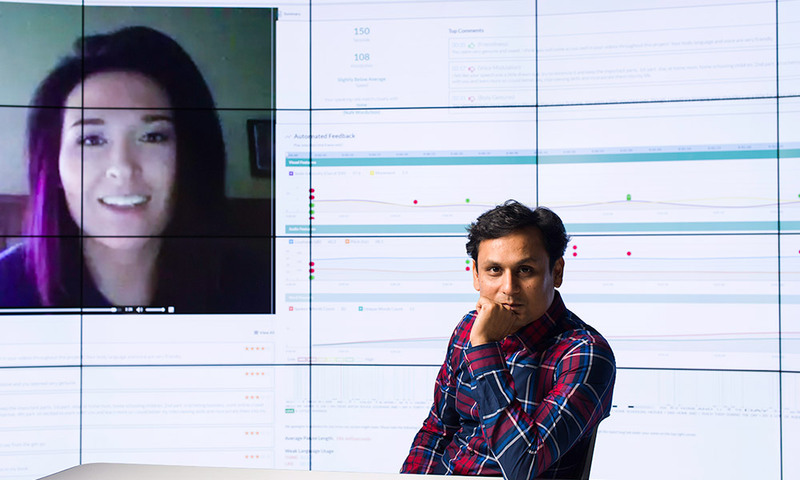 Ehsan Hoque, a computer scientist at the University of Rochester, has been recognized as a leading innovator in human-computer interaction with a World Technology Award from the World Technology Network. “When I saw the list of the other finalists in the IT software category, I thought my name was there by mistake. These are people I have admired for many years,” said Hoque, who in August was named one of “35 innovators under 35” by the editors of MIT Technology Review. He has developed a system that allows individuals to practice speaking and social skills and receive feedback in a repeatable, objective, and respectful way. He has also developed systems that help musicians practice singing vowels and provide live feedback to public speakers while they’re engaged with audiences. The IT Software category is one of 30 technology categories in which WTN honors individuals and organizations. Hoque was among 48 nominees in IT Software, eight of whom were finalists. Other winners this year include U.S. Secretary of State John Kerry (Policy) and Jeff Bezos, CEO of Amazon (Space), among many. Past winners have included primatologist Jane Goodall; Oculus founder Palmer Luckey; Alan J. Heeger, a Nobel laureate in chemistry; Mark Zuckerberg, cofounder of Facebook; Al Gore, former U.S. vice president; and Wikileaks founder Julian Paul Assange. Organizations receiving awards have included IBM, the NASA Jet Propulsion Laboratory, YouTube, Skype, Wikimedia, the Woods Hole Oceanographic Institution and Scripps Institution of Oceanography, Facebook, Apple, and Google. It may also help explain the attention his research is getting. “When you deploy your work in the real world, you have more visibility and impact,” Hoque said.